Is it any wonder that we adore Night Owl Paper Goods? From their cute birthday cards to their stuffed recycled owls to their annual wooden calendars; everything they create is eco-friendly, whimsical and lovely. Now, with their brand new baby shower invitations, expecting parents can welcome their baby in extra adorable style. 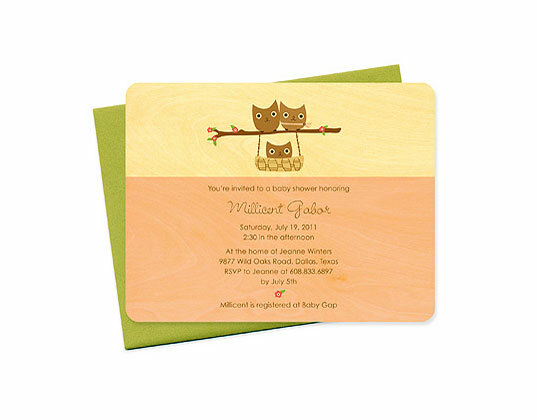 Of course we love the little owl family pictured, but also noteworthy is that these invitations are made with sustainably harvested yellow birch wood. This will be one of those baby shower cards your friends and family don’t recycle, but keep. Each card is personalized and comes with an envelope. Pricing varies due to options. Is it any wonder that we adore Night Owl Paper Goods? From their cute birthday cards to their stuffed recycled owls to their annual wooden calendars; everything they create is eco-friendly, whimsical and lovely. Now, with their brand new baby shower invitations, expecting parents can welcome their baby in extra adorable style. 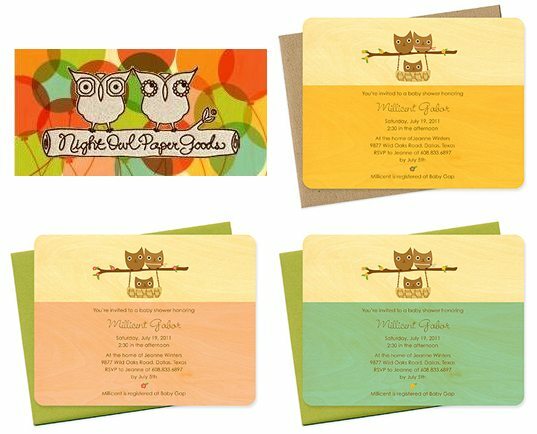 Of course we love the little owl family pictured, but also noteworthy is that these invitations are made with sustainably harvested yellow birch wood. This will be one of those baby shower cards your friends and family don't recycle, but keep. Each card is personalized and comes with an envelope. Pricing varies due to options.